Biokleen Traffic Lane Cleaner (TLC) (available here in Large Sizes) is an incredible smelling, natural liquid pre-spray best used to professionally clean light to medium soiled carpets, upholstery, tile & grout. Biokleen's TLC contains added enzymes that help increase its effectiveness with greater dwell time. This Natural Traffic Lane Cleaner is best used with truck-mounted or portable hot-water, spray / extract cleaning systems. For Truckmounts, dilute Biokleen TLC @ approximately 32 oz per 5 quart hydro-force type jug for & meter at 1:9. For Pump Sprayers, dilute at Biokleen's Natural Traffic Lane Cleaner at 4 oz/gallon of water. Apply, agitate, let dwell approx. 15 min. Then rinse / extract. For very heavyily soiled carpets or other surfaces, dilute @ 16 oz/gal in pump sprayer, agitate, let dwell & re-clean. For a lower residue, more powerful, concentrated & cost effective product, try Biokleen Fiber Glow Powder. 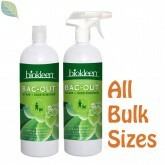 You may also try Biokleen All Purpose Cleaner in place of this product. It does not contain enzymes, but is much more concentrated. Note: Biokleen's Natural Traffic Lane Cleaner (TLC) rinses very easily & completely but (as with most liquids cleaners) must be thoroughly rinsed, as remaining product could leave a residue. Surfactants from coconut &/or corn, natural enzyme-producing cultures, grapefruit seed & pulp extract, orange peel extract, linear sulfonate, filtered water.